Each 5.5-inch Vintage figure comes with accessories, while 5 of them feature a spring-loaded mechanism: Turn the waist and the figure swings back with a punch! These and more never-released figures and collectibles are available now for pre-order. Two new figures enter the highly popular Acid Rain figure line. Sofi and The Eos Raider figure are both highly articulated and features a wide selection of accessories. From Final Fantasy IX, Zidane Tribal and Garnet Til Alexandros XVII get a Bring Arts two-pack, while Kairi, Axel, and Sora are here as Bring Arts figures based in their appearance in Kingdom Hearts III! Grab your favorite anime, movie, video game, and TV show characters as articulated figures, model kits, and statues from Bandai Spirits! Each collectible features series-accurate sculpt and character-specific accessories. Enjoy your favorite beverage while representing your favorite characters, too! Each collectible pint glass features full color art of characters from classic series. Show off your favorite anime characters with pride as hard enamel pins from CMD Collectibles! Each FiGPiN comes displayed in front of a collectible backer card and is fully capsulated in the clear protector case. The NA H2 figures from Newage are mini sports cars that convert into battling robots! These hand-painted 1/10 art scale statues are based on original 3D references from the Avengers: Endgame movie. The diorama base allows you to connect the statue with other characters to create a battle scene. Monstarz bring classic horror and sci-fi characters to life with their retro action figures! These articulated collectibles come in a retro-styled card package, perfect for display. In order to free the dragons, Spyro must step into the statue's pedestal, and the imprisoned dragon breaks free after a flash of bright light! These crystal dragon statues feature a highly detailed base replicating the exact pedestal right out of the original Spyro the Dragon video game. Each 6-inch-scale figure is carefully detailed to look like their appearance in the Star Wars universe. They feature premium details and multiple points of articulation, and include character-inspired accessories. With the Marvel Legends Series, both kid and adult Marvel fans can start a legendary collection of comic and movie-based Marvel characters. Each articulated Marvel figure includes character-specific accessories and a Build-A-Figure part to create a Thanos figure! Square Enix brings you action figures, keychains, plushies, and more collectibles based on all of their hit video game series! From Final Fantasy to Xenogears, there’s something for every Square Enix fan. Build the ultimate battlefield with Siege figures! Siege plunges fans into the epic fight to survive on the final day of the Autobot and Decepticon battle to control Cybertron. As the Autobot counter-resistance takes on the Decepticon resistance army, the unyielding Autobot army captain and city defender, Omega Supreme, lies in wait—the Autobot’s last line of defense. Build onto your collection of detailed statues from Iron Studios. New arrivals include Battle Diorama Series statues from Avengers: Infinity War and also the IT Pennywise 1/10 Art Scale statue. Grab your favorite character in 1/12 scale from Mezco! Each One:12 Collective figure is packaged in a collector friendly box, designed with fans in mind. 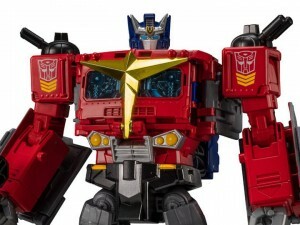 Siege’s Deluxe Class WFC-S36 Refraktor comes with HPR Telefocal Shield, EMM Distortion Blaster, Bioscale Compression Rotor accessories, while WFC-S37 Brunt Weaponizer breaks apart into 9 weapon accessories that can equip other Siege figures. Generations Smokescreen comes equipped with a W-45 Acid Pellet Blaster accessory and 2 W-50 Volt-Beam Cannon accessories that can mount on his shoulders or the hood of his vehicle mode. DC Collectibles has released 10 new items covering several lines including Batman: The Animated Series figures and DC Bombshells statues. These gorgeous figures, busts, and statues from DC Collectibles are must-haves for comic book and figure collections! Sculpted and designed by actual DC Comic artists, these collectibles of iconic villains and heroes are sure to awe and amaze for decades to come. The most epic figures from Star Wars: The Black Series are back with the Black Series Archive collection! These archive figures have photoreal deco and premium design, so fans and collectors can expand and enhance their Star Wars collections with the Star Wars 6-inch-scale figures. Banpresto has released another batch of Dragon Ball figures covering several lines; including Warriors Battle Retsuden, Tag Fighters, and World Collectable Figure! From Avengers: Infinity War comes a Nendoroid of Doctor Strange! This Nendoroid features full articulation, along with interchangeable faceplates to capture various scenes from the movie. The Eye of Agamotto has been carefully recreated in Nendroid form. Using the included hands, you can easily pose Doctor Strange as though using the amulet to stop time. The grave course of events set in motion by Thanos that wiped out half the universe and fractured the Avengers ranks compels the remaining Avengers to take on final stand in Marvel Studios’ grand conclusion to twenty-two films, Avengers: Endgame. From the anime Batman Ninja, Star Ace has created two spectacular versions of Batman dressed in his ninja gear. Each figure features a high level of articulation and cloth capes. Set sail on an epic adventure with the FiguartsZERO line of One Piece figures! Each figure features unique coloring and sculpt, making them some of the most unique additions to any collection. Bandai America has released several Godzilla items, including some chibi-style figures, 3.5-inch figures, and even a mega-sized figure! NEW FUNKO POP! & POCKET POP! Funko brings your favorite Pixar characters to life with unique stylized designs. Each vinyl figure stands between 1.5 to 6 inches tall and comes in window box packaging, making them great for display! The Mr. Basic Tool Set features everything you need to build not only Gundam model kits, but other model products as well! You can even grab easy-to-use beginner nippers for those just getting into model kits. The Deform Real series, from Star Ace, ventures into The Adventures of Middle Earth. The evil servants of the Dark Lord Sauron are the Nazgul. Also known as Ringwraiths, these creatures used to be men until their souls were twisted by the power of the Dark Lord. The Deform Real Nazgul stands just about 6 inches tall and features a stylized sculpt with an oversized head. Juohmaru from PlaWres Sanshiro is the first anime-style figure to join Sentinel's Frame Action Meister lineup! He's fully poseable and his chest cover can be removed so you can see his internal mechanisms. Regal Robot releases their Star Wars: The Empire Strikes Back Space Slug desk organizer and Tauntaun maquette replica. Created using a detailed scan of the original prop, these collectibles are made in the U.S.A. and are tributes to the artistry involved behind the scenes of Star Wars! Build and add onto your Hexa Gear ‘bots or current builds with Kotobukiya’s scaled model kits! Each kit includes weapons and gimmicks that are interchangeable between any Hexa Gear build. Adorable and mischievous, these baby Nifflers steal the show and anything shiny in Fantastic Beasts 2: The Crimes of Grindelwald. Just like in the movie, there are four different flavors of baby Niffler: black, grey, tan and one that is a mix of all three colors and carrying a stolen coin. All of them are super cuddly and baby soft! Siege plunges fans into the epic fight to survive on the final day of the Autobot and Decepticon battle to control Cybertron. The Decepticon resistance army and the Autobot counter-resistance fighters are equipped with the universe's most advanced modular weaponry, including the weapon and armor modes of Micromaster figures—sentient bots that become weapons! At long last, the classic Predators are back—and with some huge upgrades! From the original Predator movie, NECA presents the definitive collector's version of the Jungle Hunter. These awesome Dragon Ball, My Hero Academia, and more figures are available now from Banpresto! Each collectible figure features special sculpts and paint application, making them some of the most unique additions to any collection. Max Factory brings fan-favorite characters to life in their figure line, figma! Each figma features smooth yet posable joints that allow you to display them in dynamic poses and scenes. Over half a century has passed since the X-Men comics debut in early 1963 but fans of the series still consider them an unmatched classic. Now you can collect the extremely powerful X-Men leader Cyclops and the iconic superhero Wolverine in fully poseable action figure Egg Attack Action forms! 4,902 pages were recently viewed by 1,114 unique visitors. This page was viewed 1 times on Saturday, April 20th 2019 9:17am CDT. © 2019 Seibertron, Inc. DBA Seibertron.com. All Rights Reserved. Established June 2000. Seibertron.com is owned by Ryan Yzquierdo.